Caleres on Thursday reported an adjusted net income of $16 million, or 38 cents per share, missing analysts’ estimates by 7 cents. Expenses related to last quarter’s acquisition and integration of Blowfish Malibu and Vionic totaled 15 cents per share. The company reported consolidated sales of $720.3 million, up 2.5 percent from the year-ago period. Brand portfolio sales of $355.1 million were up 14.8 percent, including Vionic. Famous Footwear same-store-sales were up 1.1 percent. Total sales of $365.2 million were down, as expected, as the fourth quarter of 2017 included an additional week. Consolidated sales of $720.3 million, up 2.5 percent. Brand Portfolio sales of $355.1 million were up 14.8 percent, including Vionic. Famous Footwear same-store-sales were up 1.1 percent. Total sales of $365.2 million were down, as expected, as the fourth quarter of 2017 included an additional week. Gross profit was $277.7 million, while gross margin was 38.6 percent and adjusted gross margin was 39.9 percent. SG&A expense of $267.2 million represented 37.1 percent of sales, an improvement of nearly 90 basis points. Operating loss of $94.4 million and adjusted operating earnings of $20.5 million. The net loss for the quarter was $75.5 million, resulting in a loss per diluted share of $1.83 including $2.31 for the below items and a $0.10 benefit primarily related to the 2017 Tax Cuts and Jobs Act. Allen Edmonds $2.01 non-cash impairment of goodwill and intangible assets and $0.02 of integration and reorganization expense. Blowfish Malibu and Vionic acquisition and integration related expense of $0.15. Distribution centertransition expenses of $0.08 total. Brand Portfolio expense of $0.04 related to brand exits. 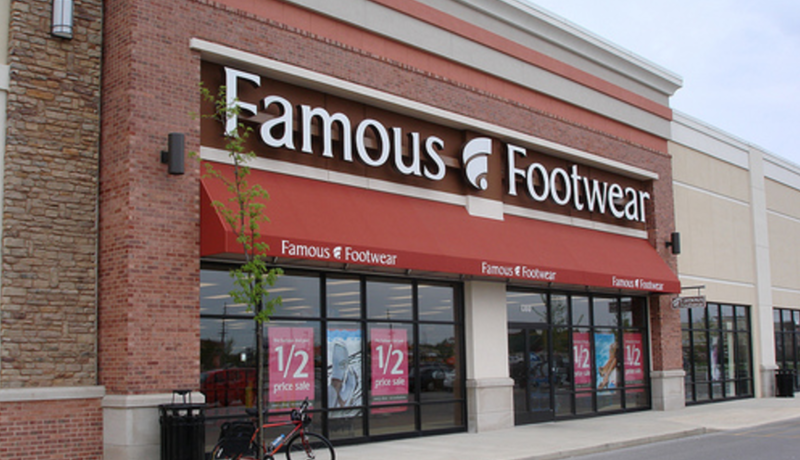 Famous Footwear retail operations restructuring expense of $0.01. Adjusted net earnings were $16.0 million, while adjusted diluted net earnings per share were $0.38 and included approximately $0.08 of dilution related to Vionic interest and amortization expense. Consolidated sales of $2,834.8 million, up 1.8 percent. Brand Portfolio sales of $1,228.0 million were up 7.0 percent, including Vionic and Blowfish. Gross profit was $1,156.3 million, while gross margin was 40.8 percent and adjusted gross margin was 41.2 percent. SG&A expense of $1,041.8 million represented 36.7 percent of sales, an improvement of nearly 45 basis points. Operating earnings were $0.4 million and adjusted operating earnings of $127.0 million. The net loss for the year was $5.4 million, resulting in a loss per diluted share of $0.13 including $2.43 for the below items and a $0.09 benefit primarily related to the 2017 Tax Cuts and Jobs Act. Allen Edmonds $1.93 non-cash impairment of goodwill and intangible assets and $0.10 of acquisition, integration and reorganization expense. Blowfish Malibu and Vionic acquisition and integration related expense of $0.27. Adjusted net earnings of $95.1 million were up 2.1 percent, while adjusted diluted net earnings per share of $2.21 were up 2.3 percent and included approximately $0.10 of dilution related to Vionic interest and amortization expense. Cash and equivalents of $30.2 million and cash from operations of $129.6 million. There was $335.0 million of outstanding borrowings under the revolving credit facility, following the October 18, 2018, acquisition of Vionic. Inventory of $683.2 million was up 20.0 percent year-over-year and included $66.5 million of Vionic and Blowfish inventory. Capital expenditures of $66.9 million were up year-over-year, due to investment in in-house distribution center capabilities. Returned $55.8 million to shareholders in 2018 via share repurchases and dividends. Results for this year reflect the new accounting standard related to the presentation of retirement benefits, which impacted reported and adjusted 2017 operating income and margin. The effect of this new standard resulted in a shift of $4.7 million of retirement plan income from fourth quarter 2017 SG&A expense to other income, net. For fiscal 2017, this amount was $12.3 million. There was no impact to net earnings or earnings per share for the fourth quarter or for fiscal 2017, due to the adoption of this standard.